BORLA Cat-Back exhausts feature patented, straight-through and multi-core technology to unleash hidden horsepower. Increased exhaust velocity adds power, driving excitement, fuel economy and the distinctive BORLA Sound of Power respected by motoring enthusiasts everywhere. Each system is built from premium austenitic stainless steel, superior to T-400 series knockoffs, to give you the absolute best in performance and durability. Ultra-smooth mandrel bends ensure maximum flow and power, and precision computer-controlled CNC manufacturing ensures an accurate fit. Best of all, BORLA stands behind every system with a Million-Mile Warranty. Just what you did expect from the world most experienced (and most winning) exhaust brand. - HIGH-QUALITY 300 SERIES AUSTENITIC STAINLESS STEEL: Proven as the industry's most durable exhaust alloy and ensures a long lasting showroom appearance. - SO EFFICIENT, IT ACTUALLY IMPROVES FUEL ECONOMY: A BORLA® exhaust can increase fuel economy at cruising speeds. 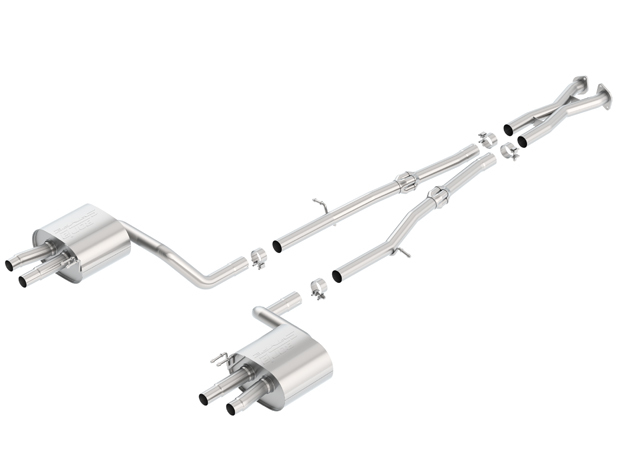 This exhaust setup features 2.25" piping and does not come with muffler tips--it utilizes the factory tips/exhaust outlet valence.